This week we had our Eternity drama at our church. Here I am, pictured at right with my new beautiful friend from church, Jennifer. We both played the part of an angel in the drama. Mrs. Pack, who wrote the drama and puts it on with her husband Mr. Pack, uses the congregation of the churches where she goes for the actors. Mrs. Pack plays the lead role of the figure Eternity, and is an anointed, beautiful woman of God. God did amazing things during the drama. The first night our entire church was filled with people, and many people went forward to receive Jesus Christ as their Lord and Savior. The second night was a little discouraging, with very few in attendance. But we just did the drama as unto the Lord, and people got saved again! 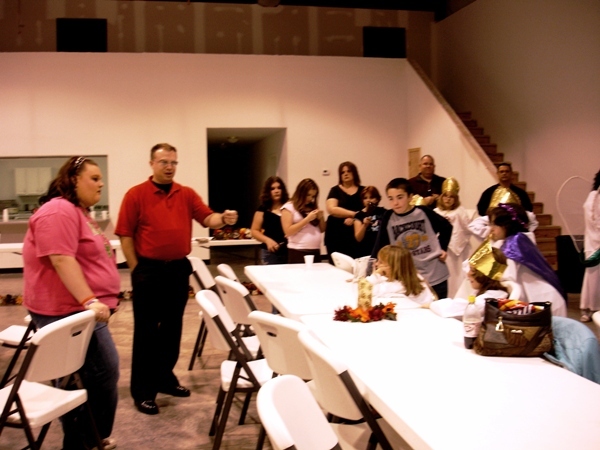 The third night, more people showed up and more people got saved – it was the most anointed night! Here are Mr. and Mrs. Pack – what a wonderful, gifted, sweet couple who really love Jesus! They have left now, going on to the next place God has for them. I will miss Mrs. Pack; I really got attached to her while she was here! 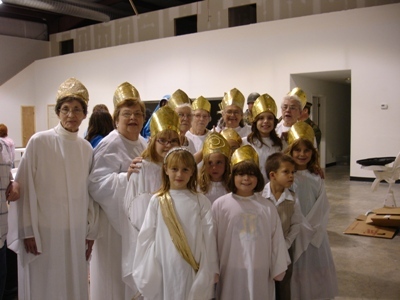 Many of our senior citizens and children portrayed the part of the saints. Our pastor Christian and his wife Bonnie played the part of a couple in church; the wife was saved and the husband was unsaved. The man who played the judgment angel at the judgment seat of Christ. These were some of the most powerful scenes during the drama, showing those who had rejected Christ and who were sentenced to hell. We also had some beautiful scenes of the glory of heaven, with God and Jesus. 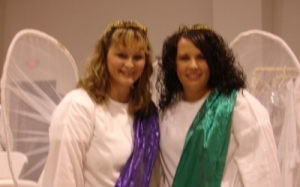 Heather who played in the teen party scene, and the girl who played Mary, mother of baby Jesus. I loved the teens using their gifts for God in the play! The baby who portrayed baby Jesus, and his mom. My friend Jennifer at the church saw this woman and her baby in the store one afternoon and thought he’d be perfect for the part of baby Jesus. So she spontaneously asked her if she’d be willing to let him be in it, and the mom agreed. While Jennifer was talking to the mom, someone else from our church who knew this mom was calling her on her cell phone to ask her if she’d let her baby be in the drama! Isn’t God just wild how He confirms things? My pretty, precious friend Brandy at church, who played the role of a young, unmarried girl getting an abortion. She did an incredible job with this part! 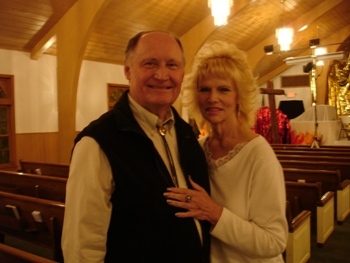 My friends Diane and Herb, who portrayed an unsaved couple getting into a car wreck. Herb also played the part of a saved soldier. Beside them are a saint and the other man playing the part of a saved soldier (the other man also portrayed the judgment angel). The children portraying more angels. Of such is the kingdom of God! Through this outreach, we were able to share the gospel of Christ in our own community in a creative way. We discovered that when we came together in unity as one body, God could do powerful things. Many of the people in our church discovered they had gifts and talents they didn’t know they even had! We had a great time together, and now plan to disciple the new converts in our church through the New Believers Handbook, to help them grow in their faith and in their understanding of God’s word. What can you do today to share the good news about Jesus? ← Are you ready for Eternity?